“The acquisition of praiseworthy moral traits with yearning and loss of blameworthy charactersitics with aversion will manifest as attainment of excellence in speech and character. Excellence in speech (husne-kalam) is defined as using words that are polite, decent and said in a gentle tone. 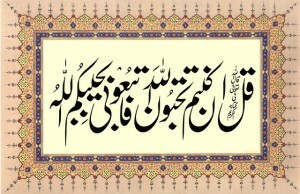 And excellence in character (husne-khulq) is to have forbearance (hilm). This entry was posted in A. Reality of Tasawwuf, B. Praise worthy morals, E. States, J. Rights , N. Advice, Q. Akabir on November 22, 2008 by 'abd.